I've purchased around 15 of these so far for myself or coworkers. I have paid way more for lesser quality lead holders. I do Masonry construction so I put them to the test and not one had failed yet. Good quality and it includes leads. Shipping takes 3 to 4 weeks, but well worth the wait. The leads are all the same. It would be nice to have leads of different hardness. These compare very closely to brands like Koh-I-Noor, Stabilo, pretty much any pricey brand you could name, at about 1/10 their price. I bought the first just to find out what I would get for that price, and I was so impressed that I had to get a couple more in case this offer goes away. 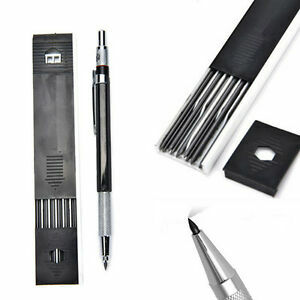 They are heavy, solid, work perfectly, and if you are a pen/pencil lover, they are beautiful. This is a great pencil for long drafting. If you have to draw for extended periods this is the pencil to have. It has a little weight to it making it easy to hold and the leads are great. The pencil and a box of 12 leads came fast from Hong Kong. God quality, especially for the money. $2!